This small, 3 story, 360 room, hotel and casino is located on Koval Lane. Koval Lane runs parallel on the east side of the Strip. The hotel is located behind Bally's. If you take the monorail between Bally's and the MGM Grand, you can see where it is. It is within walking distance of the strip, but please do take a bottle of water with you when you want to make that trip on foot during the summer. All rooms have 2 extra large double beds or 1 king bed (the 2 double beds will be replaced by 2 queen beds in the future), a table with chairs, an AM-FM clock radio, cable TV, in-room safes and hair dryers. The small Town Hall Casino offers 3 blackjack tables and 150 slot machines. 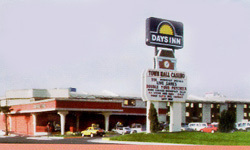 The Days Inn - Town Hall Casino has a 24-hour restaurant and a bar. There's nightly entertainment at the Town Hall casino. As this is not one of your mega Strip properties, the shopping at Days Inn is limited to a gift shop. Even though the Days Inn - Town Hall Casino might not be what you are looking for on first sight, it's not expensive ($35 - $75 per night*) and it's close to the Strip. The Days Inn also has an outdoor heated pool a spa, ample free parking and serves complementary coffee every morning in the lobby. *Rates are subject to change. Please contact the Days Inn - Town Hall Casino for current rates.